The other day I was riding my winter bike (which cost $8) and I came across this on Rt. 106. Ha, I thought as I reached to pick it up. Now I'm riding a $3 bike. 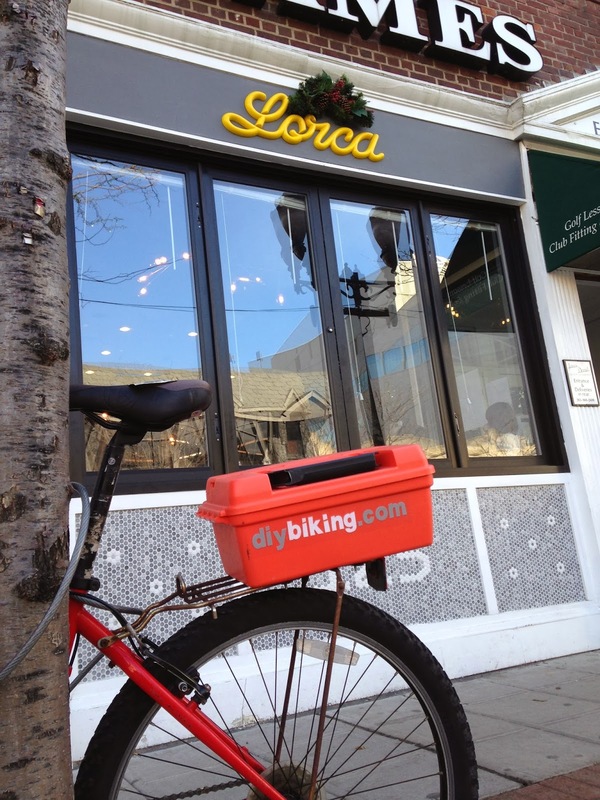 Lorca, the little coffee shop on 125 Bedford Street in Stamford displays art from different people each month. And in March, some of my works will be on display and you are invited to the opening reception on Saturday, March 1st from six to seven PM. 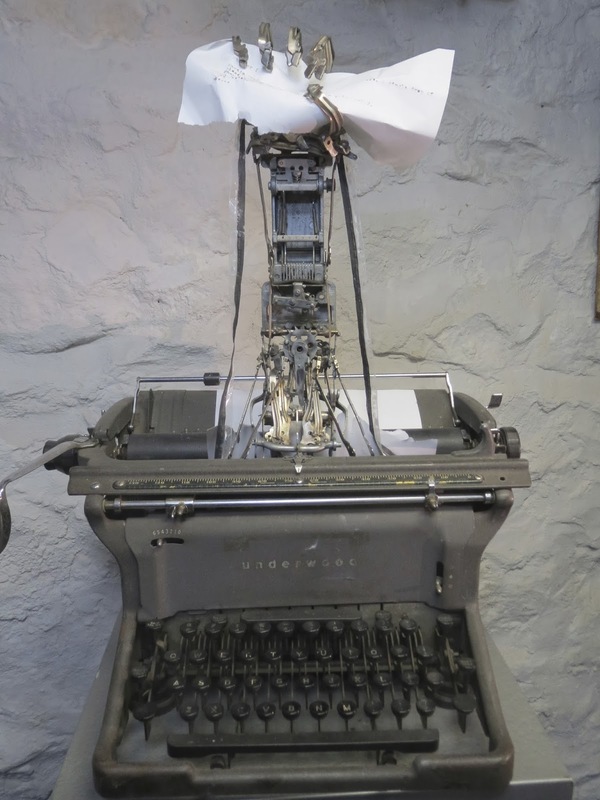 I've had stuff displayed before - my late grandfather's old Underwood typewriter was turned into something else and somehow won best sculpture in the Rowayton Art Center's juried show last year. That piece, called 'No Words,' will actually be on display again at the 'Speechless' exhibit in the Bruce S. Kershner gallery at the Fairfield Public Library beginning February 7th. 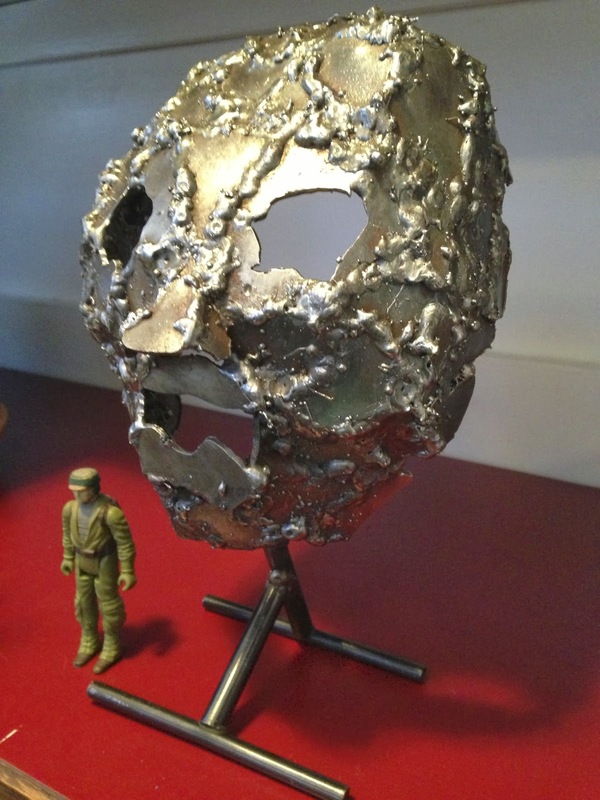 And the mask you saw last week I began making it in my class at the Silvermine Art Center isn't in my house anymore because it will be on display at the Greenwich Art Society's 97th annual juried show that opens this Friday night. The action figure wasn't part of the display. I told my metal sculpting class instructor about the exhibit by starting with: "You know that thing I was making when I set fire to your desk last week? Well, it…"
(Bob: If you're reading this: I really am sorry about your desk. I hope the papers that burned to ashes weren't important and I will keep better track of my slag when welding from now on). But the Lorca show is different; not only is it taking place at an outstanding coffee shop (the 'quiche of the day' posts on your news feed are among the most worthwhile things I read on Facebook) but all of what is on display is my stuff. So Lorca wanted to put together a video called 'Coffee With the Creator' and ask me all kinds of questions. You can see the video here. The first question asked me what my favorite Lorca drink is. That was easy. It's a cappuccino, because a cappuccino is the very first caffeinated drink I had the first time I traveled abroad. I remember flying into London, then jumping on another plane to go to Slovenia. Barely conscious, I sat on a bus that took us from the airport to the hotel in Ljublijana. And on the radio of the bus - I swear this is true - was Ray Parker's 'Ghostbusters' theme. You're not really aware of how strange and beautiful international travel can be when you're looking at a foreign country for the first time through the windows of a bus with half-shut eyes while 'Who you gonna call!?' rings out. (Unrelated: I too mourn the passing of Harold Ramis this week and believe we should honor him with a tombstone in the shape of a proton pack with a groundhog peeking out from one side and a gopher on the other). But anyway: since that day I associate cappuccinos with traveling abroad, and most of the photographs on display at Lorca are shots I've made all over the world, and I'd be happy to tell you about them if you come to the opening reception on Saturday evening. In addition to the photographs and photo print art there will be one work that isn't like the others. I'm also hoping the art inspires people to look out for cyclists - and pick up bicycles themselves. After all, this is March and this miserable winter is finally running out the clock. And you don't need to look at the just released annual report from the Connecticut Bicycle & Pedestrian Advisory Board to know there will be a lot of cyclists on the road this season - not just riding at night, either. 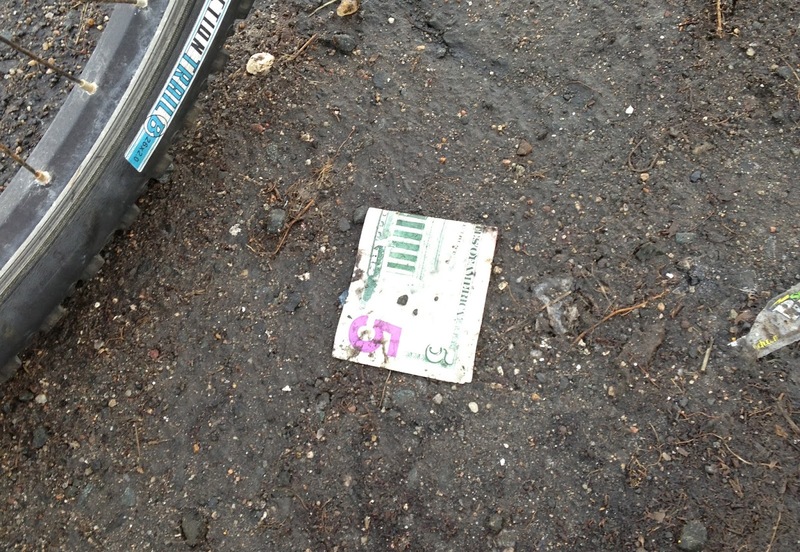 But anyway: the $5 I found on Rt. 106 this past Sunday I cleaned in a snowbank before I ran it to Lorca to buy a $5 gift certificate, which I gave to Leyla (Lorca's owner) and asked her to give it to a stranger. Just tell that person about the show, I said. In case you're wondering, since I am still freelancing/between careers, $5 is about all I have to spend on any kind of marketing budget for this show, so any word you put out on The Twitter or elsewhere about the show would be helpful. Whether you do that or not, please come to Lorca on Saturday evening at 6pm for the opening reception. Failing that, come to Lorca at anytime anyway to have a cappuccino and think about traveling abroad, cycling, creating your own artwork, or all three. Thanks for reading and thanks for riding.